Castle Cleaning & Oriental Rug Co. is the home of the world-renowned Auserehlian Cleaning system. Authentic hand washing and compressed-air cleaning for fine textiles. Check our references and workmanship guarantee! Phil Auserehl, creator of the world-renowned Auserehelian Cleaning System, personally supervisesProfessional Oriental Rug Cleaners the in-plant oriental rug cleaning operations. 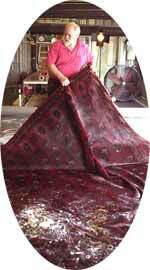 Pre-Inspection – After inspecting the rug for any apparent special conditions, we will ask for the customer’s work authorization. With written documentation, your rug will be tagged, cleaned, and invoiced accordingly. Wash – An expert hand-washing in a submersion bath assures you that a complete cleaning is being performed. The further use of compressed air, underwater, assists with a “Jacuzzi” effect for gentle agitation. Rinse – Complete flushing away of both soils and cleaning agents allows us to achieve drinkable rinse water conditions. Dry – The importance of speed and efficiency during drying is achieved in our controlled atmosphere drying room. Repairs & Restoration – Our reweaving abilities are an important and valuable service which is available with individualized quote for each rug. ULTI-MAT Underlayment – This area rug pad has the dual purpose to perform on both hard surface floors or on top of carpeting. Padding will protect both your rug and your floor and it is a good investment for personal safety. Click here to read our letter from Charles T. Ellis about his “family heirloom”. If you have questions about your oriental carpets, persian rugs or other flooring questions or comments, click here to ASK PHIL.